Stone walls are one of Ireland’s most distinctive landscape features and it is estimated that the Irish countryside is a patchwork of over 250,000 miles of stone wall. Because the land in many parts of Ireland – especially the western regions – is naturally very stony, in order to be farmed they had to be cleared of these stones. Since there was no easy method of getting rid of stones and there was a need to create separate divisions of land, the obvious thing to do was to build walls. When looking at fields today it can be said that the size of the fields was proportional to the stoniness and poverty of that area (if there are more stones to be cleared, more walls are built and the fields are smaller). 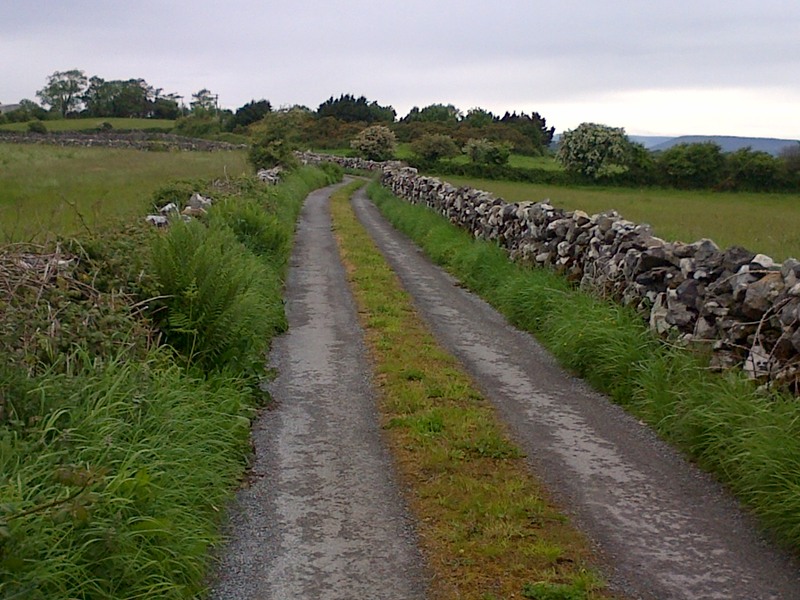 However, dry stone walls are rarely seen in areas where the soil is not so poor; for example, you will not see them in East Cork, South Tipperary or Meath for example where ditches or dykes and hedges were and are the common way of dividing the much larger fields. 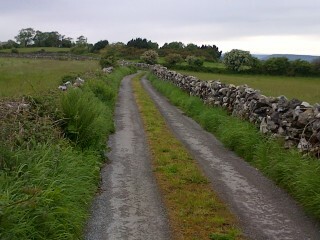 Each county which does build dry stone walls has naturally developed its own style. 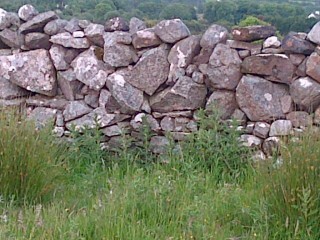 The most common type of wall which dominates much of western and central Ireland are low ones of rounded stone which have big gaps between the stone. However, other types exist such as single, double, feídin, stone and sod and wedged dry stone walls. Single stone walls: The largest stones are placed at the base of the wall with stones graduating downwards in size as the wall ascends. Double stone walls: These walls are built with two faces, one each side of the wall. The centre is hearted with smaller stones and the wall is tied together with through stones. Combination walls (Feídin walls): These walls have small stones at the base which is built as a double wall while the top half of the wall is built as a single wall with large stones used first graduating to small stones at the top. In Oughterard and the greater Connemara area limestone and granite are the dominant stone types and while all three major wall types can be found, low single stone walls are most prevalent. 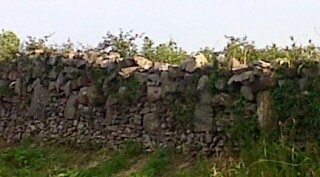 The building of many of these walls was one of many skills within the rural farming tradition. These walls are built without any tools and with no mortar, the stone is not cut (though it may be broken) with whatever stones are available are made to fit as well as possible.